Progress in Running Means Relentless Forward Motion | Fit Girl. Happy Girl. Let’s talk about progress for a little bit. Progress, by definition means a forward or onward movement. Add the word relentless before that definition and you get progress in running- relentless forward or onward movement. Ok, so I’ve become a tad bit addicted to distance running. I went from couch-to-5K-to-half-marathon-to-marathon, in a year. But is that really progress? I’m a firm believer that anyone can become a runner. I don’t care if you’re overweight, a couch potato, or just a stubborn person like I used to be who would always say, “I hate running.” Everyone has the potential to become a runner. But can everyone make progress and become a good runner? A fast runner? An elite? I don’t know. I think progress takes a lot of time, hard work, dedication, and above all else patience. In the year that I’ve been running, I’ve seen progress in my paces and average finishing times. But I’ll be the first to admit I lack patience. I want results now. 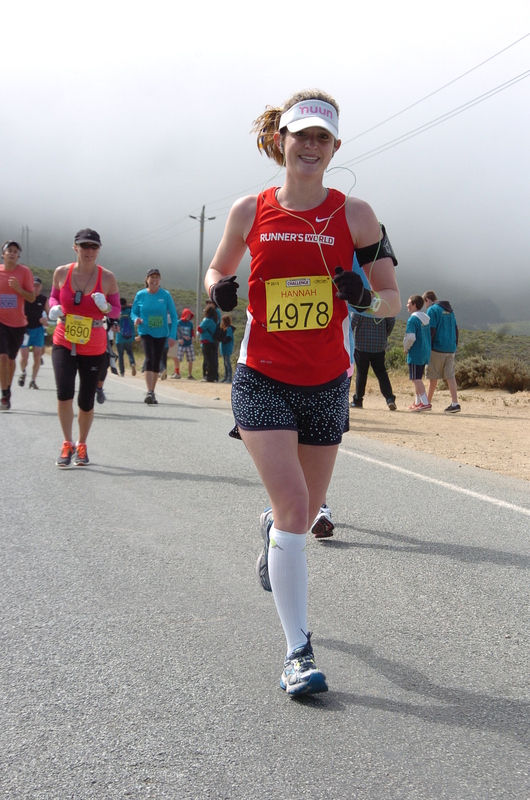 So since I completed my first marathon at Big Sur in April, I’ve been focusing on making strides with my progress (again, pun intended, sorry I can’t help it). I’ve taken to doing interval workouts every Wednesday to work on my speed. I’ve committed myself to strength training by doing circuit workouts, lifting, and really focusing on my core. I’ve also tried to maintain a 22-25 average weekly mileage, although I’m in between training cycles. I’ve continued to run five days a week. All of this will help me to continue my relentless forward movement, a.k.a progress. But will it all work the way I’m hoping it will? Who knows. What am I even hoping to achieve? I still don’t know that either. All I know is I want running faster for longer to feel easier. I know everyone wants that but I’ve seen my progress over the past year and I’m just hoping it’ll continue. What I do know is that it is possible to get better. I look at some of my fellow running bloggers like Ashley who ran her first marathon at a finishing time very similar to mine and is now, just a few years later, chasing down a BQ (Boston qualifying time). I look to Lora, who ran her first marathon in 2011 and has continued to PR since, despite battling through a stress fracture. Both of these runners, and countless others, inspire me and make me truly believe progress in running is possible. It may be tough but the relentless forward motion will pay off. I just need to stop being so impatient. How do you measure progress? Let me know in the comments below! You reflections are very similar to my own from earlier this week. I think many of us strive to see progress happen at a faster rate than we can realistically see. Although its great to gain inspiration from other runners, its also important to remember that each of us faces different obstacles and have different circumstances that affect our training. So in answer to your question, how do I measure progress? I’m trying to focus on my own personal achievements and abilities instead of comparing myself to others. That way, I can focus on my own progression instead of trying to outdo somebody else. Great comment here, Kathryn! It’s definitely important to focus on your own running rather than comparing yourself to other runners so it’s good that you do that. Plus, it’s much more fun to celebrate your personal achievements! Thanks, Ashley! I feel ya about PRs! It’s good you can remain realistic but I agree, devotion and perseverance can help to make anything realistic! I am impatient as well, particularly since I feel like I “missed out” on running because I started so late. However, be careful you don’t let relentless progression take over the fun part. I am stepping back from training plans etc for a month to just enjoy. I started late too! But I agree, it’s good to take a step away from training plans for a little. I’m in a between-training cycle oasis right now and I have to admit I don’t hate it! Yes, you’ve made tremendous progress. It’s downright inspiring. Keep at it! Patience is definitely a virtue. You will continue to see progress, especially now that you’re committed to “serious” training (intervals and strength). You’ll continue to get PRs, and you’ll be running faster for longer in due time. What keeps me motivated after close to 18 years of running is setting a goal for every single run in addition to the usual “run X time at Y distance in Z race” big picture goal. It can be non-running related (run past that bakery and see when it’s open on Sunday), silly (don’t collapse in a heap on this 90-degree day) or very specific (run 5 tempo miles at 6:40 pace), but it definitely helps get me out on the road and focus on continuing to make progress. Thank you, Brian! I really like your suggestion of setting a goal for each run, especially the non-running related or silly ideas. It’s a good way to mix things up for sure! Great post! I’ve also had to work hard on patience when it comes to reaching running goals. (I even find that it’s made me more patient overall.) I measure progress by comparing training splits and race times, similar to how you’ve done here. I also pay attention to how I’m feeling – body changes, endurance through longer distances, how I feel during/after a run, where I’m at mentally…reminding myself that there’s more to progress than numbers. Taking some time off from checking all of the “stats” and running by feel has actually helped me get a little faster and re-connect with the joy of running. I recommend it, even for just a short period of time! I love looking at forward progress! It is what keeps me chasing PR’s. I have no idea what my limits are so I keep pushing towards them. Looks like you are doing the same! Way to go! Keep those dreams alive!